Burgos lies on one of the principal pilgrim routes of the Camino or the Way of Saint James and during our visit we had to share the streets and the restaurants and the hotel with dozens of foot weary walkers all sharing their hiking tales as they walked towards their ultimate objective – the city of Santiago de Compostela. Santiago de Compostela is the capital of the autonomous region of Galicia and a UNESCO World Heritage Site. It is located in the most northwest region of Spain in the Province of A Coruña and it was the European City of Culture for the year 2000. I didn’t know this but after Jerusalem and Rome it is the third most holy city in Christendom and the cathedral is the destination today, as it has been throughout history, of the important ninth century medieval pilgrimage route, the Way of St. James. Santiago is such an important pilgrimage destination because it is considered the burial site of the apostle, James the Great. Santiago was one of the twelve disciples and a devout follower of Christ but in 44 A.D. he became the first of Apostles to suffer martyrdom when Herod Agrippa arrested and (according to the story) personally beheaded him (this seems rather unlikely to me) in Jerusalem. According to legend Santiago had preached for a while in Iberia prior to his execution and after his death his own disciples returned his body by boat back to the peninsula (this also seems rather unlikely). On the way they were caught in a storm and almost certainly doomed when a ship miraculously appeared, led by an angel, to guide them to land and safety. 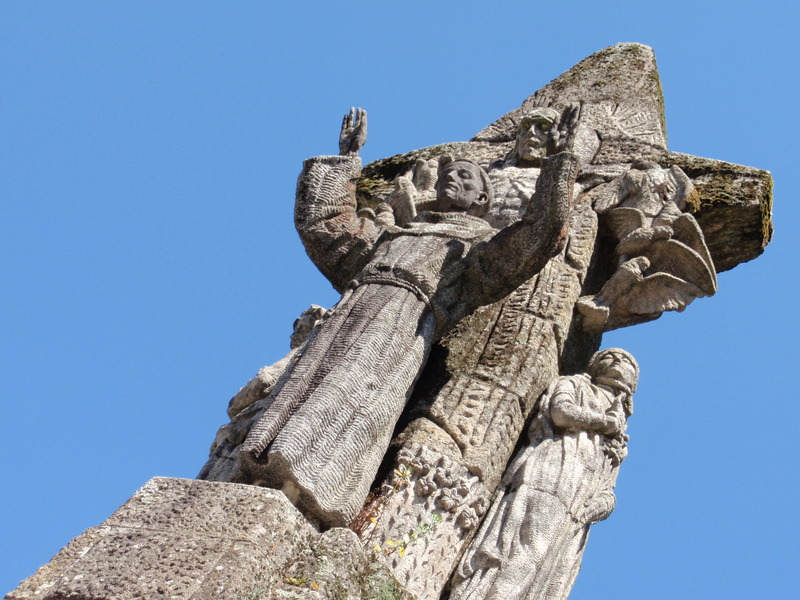 They buried the saint near Compostela, ‘field of stars,’ where Santiago lay forgotten for nearly eight hundred years. The tomb was conveniently rediscovered in the ninth century in a time of great need when Christian political and military fortunes in Spain were at their lowest ebb after they had suffered defeat time and again at the hands of the Muslims, until that is God revealed the Saint’s remains, and inspired them with the confidence that he was on their side, fighting in the battlefield with them through the heroic figure of Santiago and the holy saint became a warrior. People continue to take the Pilgrim trail and there were many here in Burgos who could be instantly identified by the pilgrim staff and the symbol of the scallop shell. The shell is the traditional symbol of the pilgrimage because the grooves in the shell, which come together at a single point, represent the various routes that pilgrims travelled, all eventually arriving at a single destination. It is also symbolic of the pilgrim because just as the waves of the ocean wash scallop shells up on the shores of Galicia, God’s hand also guides the pilgrims to Santiago de Compostela. 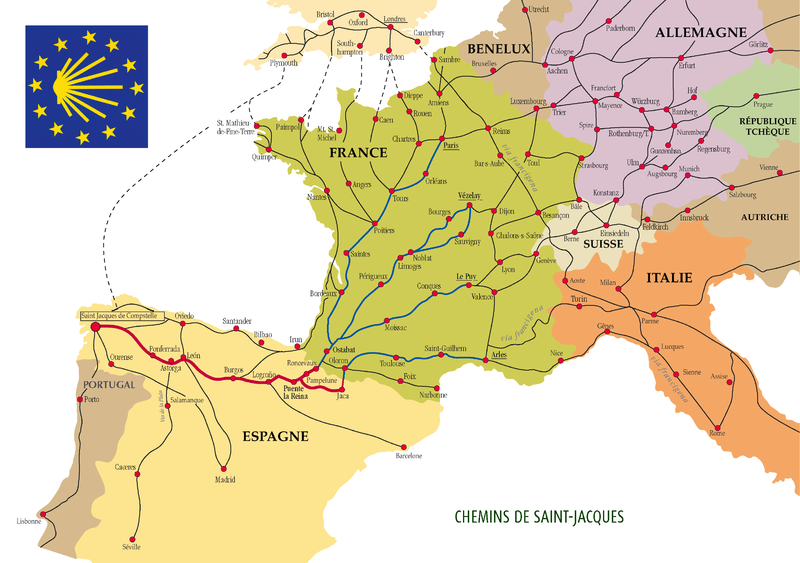 I have been giving some thought to perhaps tackling the Camino myself one day and have been looking at the various different routes. 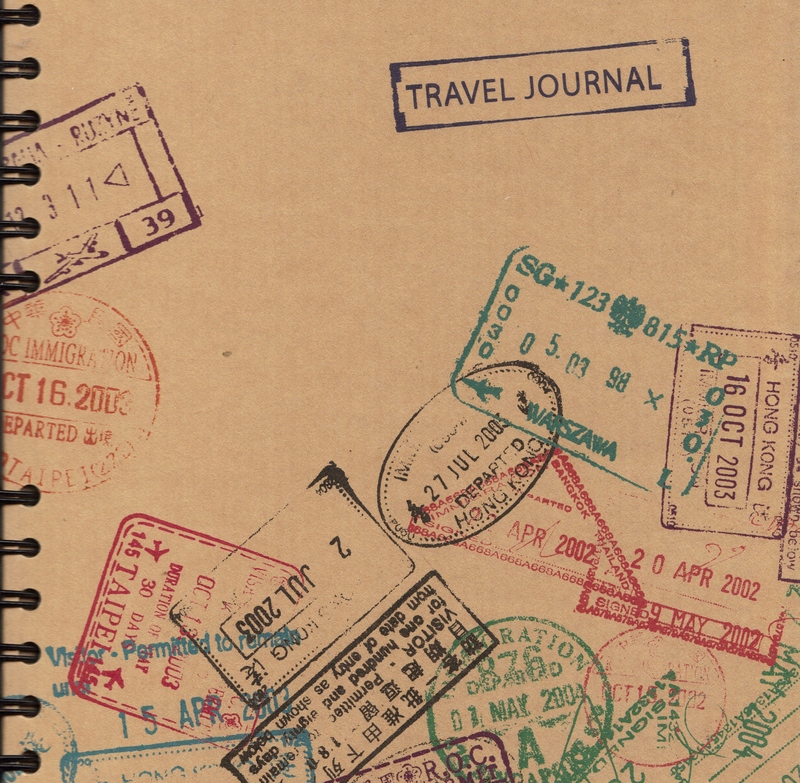 I have to say that I may have a preference for the one that starts in Plymouth in the UK because that would seem to include rather a nice cruise on a P&O ferry across the Bay of Biscay and an evening in the duty free bar followed by a just short stroll from A Coruña to Santiago de Compostela. St James the Apostle is the Patron saint of Spain and if El Cid represents the secular aspects of heroism and military conquest during the Reconquista the spiritual hero representing the religious justification and the Christian ethos of the crusade against the Muslims was Santiago. 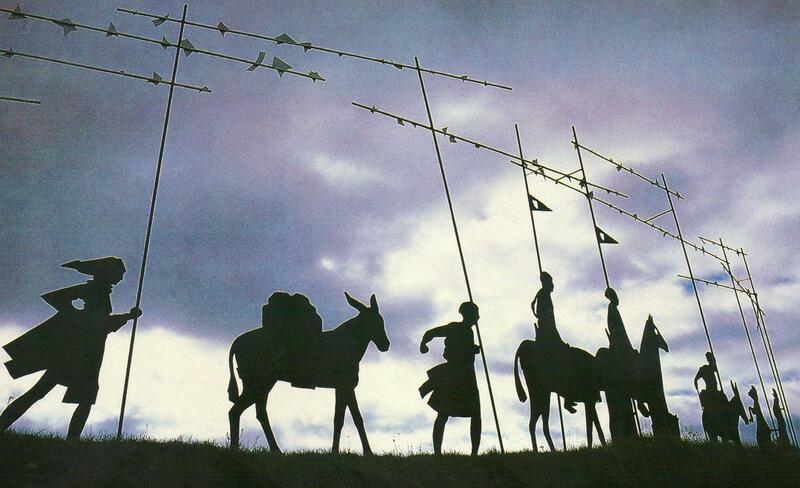 In ‘Don Quixote’ Cervantes wrote – ‘St. James the Moorslayer, one of the most valiant saints and knights the world ever had … has been given by God to Spain for its patron and protection.’ Since the reconquest ‘Santiago y cierra España’, which means St James and strike for Spain has been the traditional battle cry of Spanish armies. The truth was that as the Northern Kingdoms began to assert themselves they needed spiritual assistance and justification and in this era of crusading reconquest there was a need for the living presence of a religious-national figure as an emblem of Christian strength and supremacy that was capable of rallying around themselves the Spanish Christian forces. This was to be Santiago whose image fulfilled the desire of the Iberian Christians for heroes to emulate, and unite them in their struggle for political and religious independence from Muslim rule. An important manifestation of the crusading mentality during this time was the creation of an iconic patriotic creation of Santiago and the mythical military contribution of St James to the Reconquista was the inspirational presence of the Saint on the battlefields of the peninsula. The most famous of these was the legend surrounding the battle of Clavijo in 844, where the vastly outnumbered and demoralised Christian forces were inspired by the appearance of St James in a full suit of armour riding on a galloping white horse with a sword in the right hand and the banner of victory in the left. Modern historians dispute that there ever was such a battle but the story goes that the night before the encounter, Santiago appeared in a dream to the leader of the Spanish forces, King Ramirez of Castile, and promised him a victory over the Muslims. The following day, at the height of battle, the warrior-saint appeared on the battlefield, leaving behind him the defeated infidels that he has slaughtered and crushed to the ground and in front of him what remained of the terrified enemy promptly surrendered. 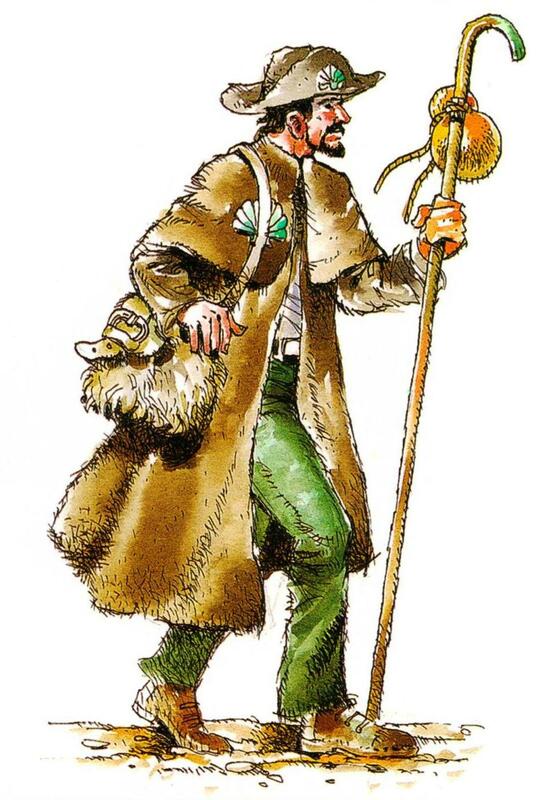 Thus was born the legend of Santiago Matamoros, the Moorslayer. There was certainly no mistaking that this is a very holy city indeed and the route to the Cathedral was lined with churches, monasteries and seminaries and finally we emerged into the central square, Praza de Obradoiro, where the Cathedral (which is depicted on Spanish eurocent coins) loomed high above in a most spectacular and impressive way. The twin towers soared into the sky as though waiting for take off at Cape Kennedy Space Centre in a sensational flourish of Baroque architecture with stone carvings of St James in pilgrim clothes, crowned in a bric-a-brac sort of way with balls, bells, stars, crosses and weathercocks, decorated with golden lichen and stubborn flowers and bits of grass that had grown improbably from the crevices between the stones where the wind had blown the seeds. Inside, the Cathedral is nearly a hundred metres long and over twenty metres high and is the largest Romanesque church in Spain as well as being one of the biggest in Europe. We had a good look around but it was a approaching lunch time and so we declined to join the long queue of pilgrims and visitors who were waiting in line to visit the crypt and see the box that contains the bones and relics of St James and left by a side door that opened onto another remarkable courtyard that was surrounded by huge medieval buildings and magnificent statues. It was hot now and time for a drink so we found a place in the shade and enjoyed a first glass of Estrella Galicia, a local brew from the city of A Coruña on the north coast and then we moved on and disappeared inside the narrow side streets surrounding the cathedral to find somewhere traditional to eat and almost immediately came across the Restaurante de Buen Pulpo that had a tempting tapas menu on the wall outside. This was what I had been looking for unsuccessfully on my last visit to Spain and we hung around until an outside table became available and when one did occupied it immediately and began the difficult task of menu selection. We decided upon sardines, calamari, tortilla and salad and some more Estrella Galicia of course. The food was reasonably priced and tasted divine and afterwards we left the little restaurant and continued to explore some more of the old city and after a couple of hours I felt confident to declare this one of the nicest places that I have ever visited. 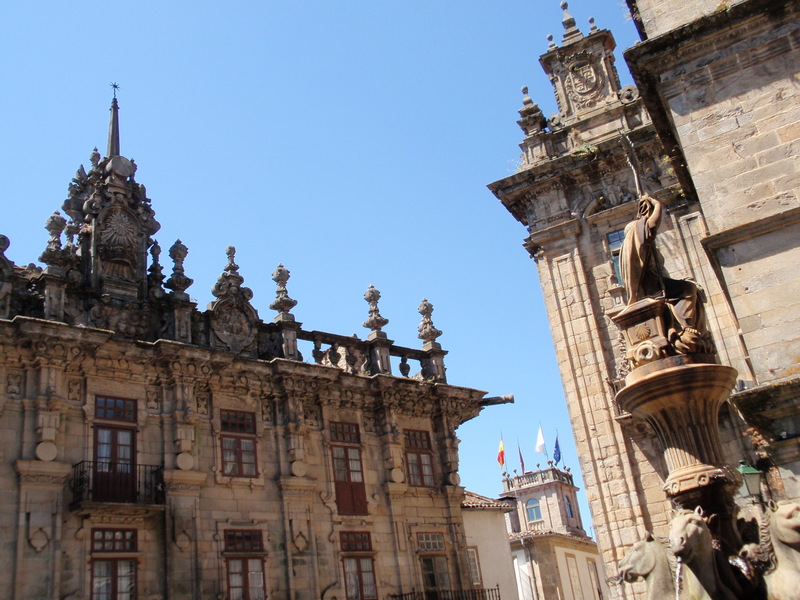 After completing a circular route we arrived back at the Praza de Obradoiro where we took some final blue sky photographs before leaving and returning to the car park. After a thorough inspection for damage to the Yaris we drove out and picked up the road to Pontevedra, which is where I thought we were staying. We drove for twenty kilometres along a motorway and then a further thirty along what turned out to be a disappointing coast road through some industrial towns that we abandoned after about half way along and found a fast road to the city instead. This was where things went badly wrong and we became baffled by the map and our inability to locate the hotel where we had a reservation. As usual I became irritated and started to blame anyone and everyone for the predicament, Octopus Travel, Multimap, the man at the hotel who couldn’t understand where we were or how to direct us there and practically anybody else who happened to be on the road this afternoon. Eventually we sorted it out and I have to confess that it turned out to be my fault all the time. I had completely misunderstood the map and the directions and we were about thirty kilometres away from our intended destination. Being a man it is hard having to own up to getting things so badly wrong but I had to agree that it was all down to me and that I should have brought a proper map rather than rely on the hopelessly inadequate one that was in the glove box of the car. The problem is that I tend to think of road maps as an item of unnecessary expenditure but on this occasion my desire to save €5 or so had led to me wasting about ten litres of fuel! Eventually we arrived at the hotel that was in Pontescures not Pontevedra and we checked in to the very traditional Hotel Corona de Galicia, which it turned out we had driven past nearly two hours before, and made straight for the bar where the barman poured drinks and provided us with little plates of appetizers. As we sat relaxing and calming down a coach pulled up outside and about thirty Spanish holidaymakers flooded into the hotel and filled up the lobby and the bar, this, it turned out, was a hotel that caters mostly for Spanish coach tours with people sensibly escaping from the east of the country and presumably all of the ex-pat Brits! 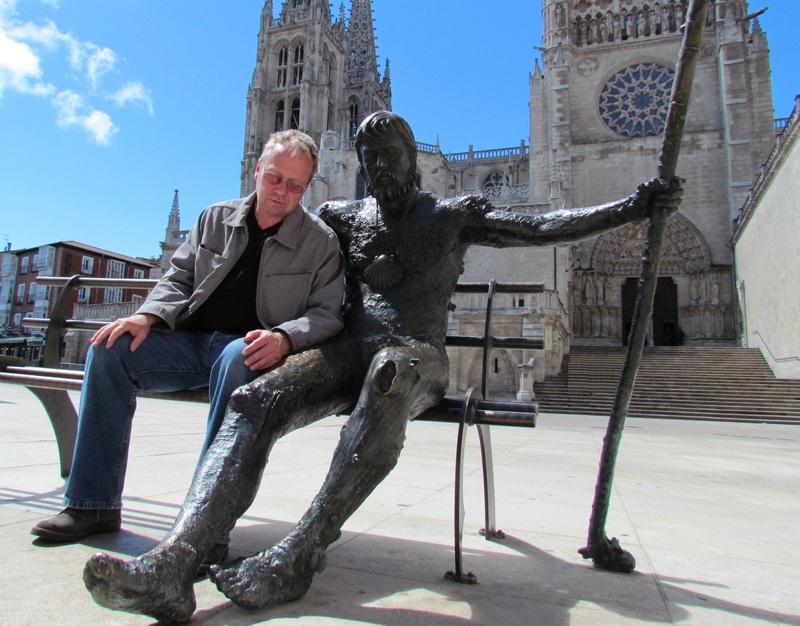 With regards to tourism Northern Spain and especially Galicia have been very much a hidden treasure over the past fifty years that the Spanish seem to be sensibly retaining for themselves. Later we had a sea food dinner in the restaurant and at the end of the evening we realised that we hadn’t seen anyone from the United Kingdom or heard English being spoken since we had left the aeroplane nearly twelve hours before and that was very refreshing. We had found the real Spain at the first attempt! 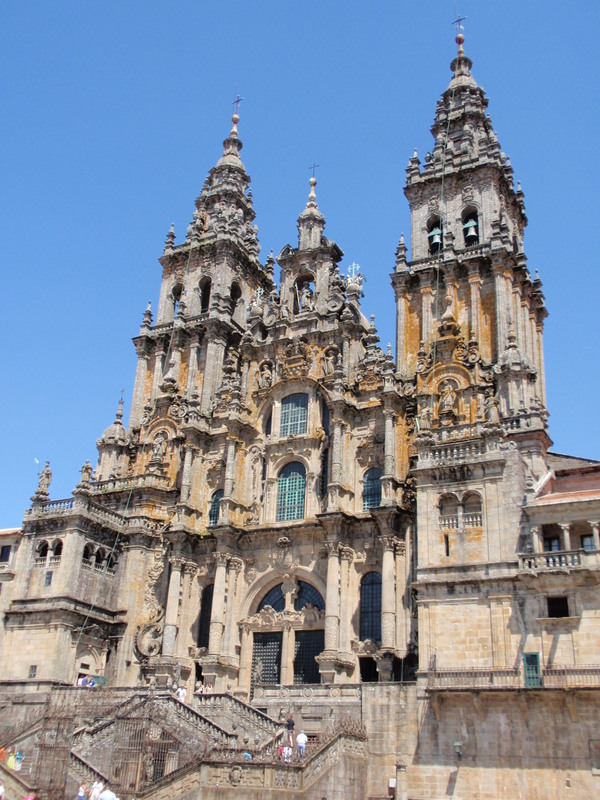 Santiago de Compostela is the capital of the autonomous region of Galicia and a UNESCO World Heritage Site. It is located in the most northwest region of Spain in the Province of A Coruña and it was the European City of Culture for the year 2000. I didn’t know this but after Jerusalem and Rome it is the third most holy city in Christendom and the cathedral is the destination today, as it has been thoughout history, of the important 9th century medieval pilgrimage route, the Way of St. James. Santiago is such an important pilgrimage destination because it is considered the burial site of the apostle, James the Great (Santiago means saint James) and legend holds that St. James’s remains were carried by boat from Jerusalem to northern Spain where they were buried on the site of what is now the city. People continue to take the Pilgrim trail and there were many here today who could be identified by the pilgrim staff and the symbol of the scallop shell. The shell is the traditional symbol of the pilgrimage because the grooves in the shell, which come together at a single point, represent the various routes that pilgrims travelled, all eventually arriving at a single destination. It is also symbolic of the pilgrim because just as the waves of the ocean wash scallop shells up on the shores of Galicia, God’s hand also guides the pilgrims to Santiago de Compostela. There was certainly no mistaking that this is a very holy city indeed and the route to the Cathedral was lined with churches, monasteries and seminaries and finally we emerged into the central square, the Praza de Obradoiro, where the Cathedral, which is depicted on Spanish eurocent coins, loomed high above in a most spectacular and impressive way. Inside, the Cathedral is nearly a hundred metres long and over twenty metres high and is the largest Romanesque church in Spain as well as being one of the biggest in Europe. We went inside and had an inquisitive look around but it was a approaching lunch time and so we declined to join the long line of pilgrims and visitors who were waiting in line to visit the crypt and see the box that supposedly contains the bones and relics of St James and left by a side door that opened onto another remarkable courtyard that was surrounded by huge medieval buildings and magnificent statues. We walked for a while through the ancient streets and through a quaint little green open space and then our thoughts turned to food so we returned to the city and went to the Restaurante de Buen Pulpo for a tapas lunch. Disappointingly there were no sardines but we chose instead calamari, clams, Galician cod, tortilla and salad and some Estrella Galicia of course. The food was reasonably priced and tasted divine and afterwards we left the little restaurant and continued to explore some more of the old city and after a couple of hours I felt confident enough to declare to myself that this one of the nicest places that I have ever visited. Because of its Celtic roots Galicia doesn’t have sombreros or flamenco or even bull fighting and in a side street adjacent to the cathedral there was a man squeezing the life out of some bagpipes that sounded as though he was castrating an extremely uncooperative cat. It was excruciatingly painful so we moved on and walked around the streets for a second time. It is an interesting fact that Galicia has a culture, which is both unique and distinct from the rest of Spain, and the core of this difference is centred upon Galicia’s identity as a Celtic, rather than a Latin or Hispanic sub nation. Galicia along with Andalusia, Catalonia and the Basque Country are acknowledged as independent historical nationalities under the Spanish Constitution and as a consequence enjoy special rights and privileges. One of the really good things about Santiago de Compostella was that it felt like being in Spain and not like the little England of the south and east coast costas. Galicia is a popular holiday choice with Spanish people living in the south and central cities of the country because they like to holiday in the north to escape the oppressive heat and enjoy Galicia’s famous seafood. In August alone, eight million Spaniards travel north from cities like Madrid and Barcelona to the more temperate climate of Galicia with its green scenery and spectacular beaches. The Galician climate though is changeable and the region is often referred to in Spain as the wet or rainy region. Despite this, it is those in the south and central cities of Spain that flee to Galicia in July and August to enjoy the hot, but not oppressive, summer weather. The local geography is also dramatically different from that of the central and southern regions with meadows, hills and mountains and is known affectionately in Iberia as green Spain.